The absence of GMO is confirmed by molecular-genetic examination at Russian Academy of Medical Sciences. The Cappuccino Shake has the rich, tart taste of coffee with whipped milk, providing a great and healthy start to your day. 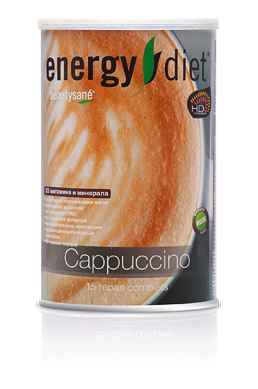 It contains natural caffeine, to give your body energy. Soy proteins, dextrose, pea proteins, milk proteins, vegetable oil (soybean oil, dextrose syrup, caseinate, natural flavor), cocoa fat, starch, potassium citrate, coffee extracts, calcium ortho-phosphate, nature-identical flavorings, chicory inulin, thickening agents (cellulose gum, gum tara), magnesium carbonate, sweeteners (acesulfame-K, neohesperidin DC), vitamins (PP, C, E, A, B5, D3, B6, B1, B2, B9 , biotin, B12), salt, Acerola Malpighia glabra L. (149 mg / 100 g), ferrous sulfate, zinc citrate, royal jelly (31 mg / 100 g), manganese gluconate, copper gluconate, enzyme complex, potassium iodide, sodium selenite.